What Nuts Are High in Protein and Low in Saturated Fat? Nuts are packed with beneficial nutrients, like magnesium and folate, and they're also high in dietary fiber. Although they're high in calories and fat, nuts can be a welcome addition to your health-conscious diet. They're naturally low in saturated fat — unhealthy fat that's linked to heart disease — and high in unsaturated fat, which is good for your cardiovascular health. Some nuts also offer a significant amount of protein, which supports strong muscle tissue and helps with tissue growth and repair. Black walnuts and almonds make your best choice if you're searching for a nut that's high in protein and low in saturated fat. Choose black walnuts for the best combination of protein and low saturated fat. Each ounce of this type of walnut offers 7 grams of protein and contains just 1 gram of saturated fat. You'll also get 1.5 grams of heart-healthy omega-3 fatty acids — a family of unsaturated fats that reduces your risk of cardiovascular disease and also promotes healthy brain function. Black walnuts contain a generous amount of manganese as well — 55 percent of the daily value — which supports your metabolism and plays a role in manufacture of cartilage and bone. An ounce of black walnuts also contains 14 percent of the daily value for both magnesium and phosphorus, as well as 19 percent of your daily copper needs. Almonds are your next best option if you'd like to snack on nuts high in protein but low in saturated fat. An ounce of almonds contains just 1 gram of saturated fat but boasts 13.5 grams of healthy unsaturated fatty acids, including 1.3 grams of omega-3 fatty acids. Each 1-ounce serving also has 6 grams of protein. Gram for gram, they're one of the highest-protein nuts. In addition to quality protein, almonds provide beneficial vitamins and minerals. Each ounce offers 32 percent of the vitamin E you need daily, plus 20 percent of your daily value for riboflavin, a B-vitamin involved in nutrient metabolism. You'll also get 31 percent of your daily manganese needs and 20 percent of the magnesium you need in a day, plus significant amounts of phosphorus and copper. Several other nuts also offer a significant amount of protein while being low in saturated fat. An ounce of pistachios contains just 1.5 grams of saturated fat but has 6 grams of protein, while an equivalent serving of pine nuts or hazelnuts contains 4 grams of protein and 1 gram of saturated fat. 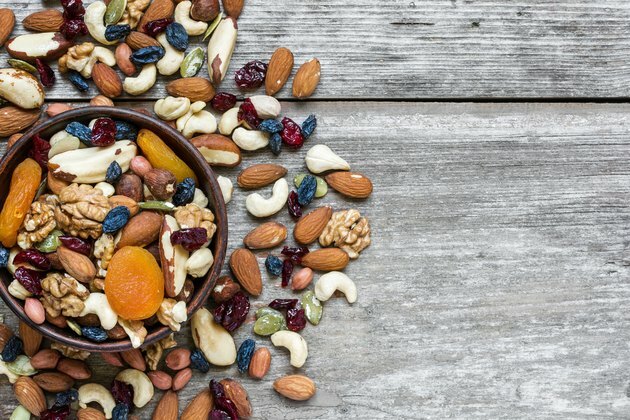 Mixed nuts usually contain an average 5 grams of protein, with only 2 grams of saturated fat, although the exact protein and saturated fat content might vary, depending on the makeup of the nut mix. Brazil nuts and cashews each offer 4 grams of protein per ounce, but they're slightly higher in saturated fat — 4.5 grams and 2.5 grams per serving, respectively. And English walnuts provide 4 grams of protein and have 2 grams of saturated fat. If you're looking for an alternative to nuts, try seeds as a high-protein, low-saturated fat addition to your diet. For example, 1 ounce of either pumpkin seeds — sometimes called pepitas — or watermelon seeds boosts your protein intake by 8 grams. And pumpkin seeds have just 2 grams of saturated fat per ounce, while watermelon seeds have 3 grams. Use these seeds the same way you would nuts — enjoy them on their own as a snack, as a crunchy-and-satisfying salad topping, over hot or cold cereal or blended into seed butters. Which Nuts Have Omega-3 Fatty Acids?